Aptar’s new tethered closures have been designed to meet the requirements of the new European regulation called “Single-Use Plastic” (SUP), recently adopted by the European Parliament on March 27th, as well as the AB 319 California legislation in the USA. Both regulations have the goal of increasing the amount of bottles being collected and recycled, consequently reducing marine litter. As a result, the CPGs (Consumer Packaged Goods companies) have been calling upon their partners to develop solutions that not only comply with the new regulations, but also provide environmentally focused consumers with solutions that fit their lifestyles and provide them with the best packaging experience. FLIP LID: in addition to its sustainability benefits, FLIP LID is a uniquely simple, consumer friendly closure that creates a convenient and enjoyable experience, as consumers no longer need to unscrew the cap, but simply flip it open to drink or pour the product. Consumers will also benefit from the patented, wide-opening hinged lid, and the audible “click” when reclosing. FLIP LID has been developed in partnership with Krones to increase filling line efficiency in a 26/22 neck finish. Other standard neck finishes are currently in development. Stay-With™ : in addition to helping to promote recycling of the cap, Stay-With™ is a unique, patented, multipurpose technology which provides improved consumer convenience, as they no longer need to worry about the closure being misplaced. 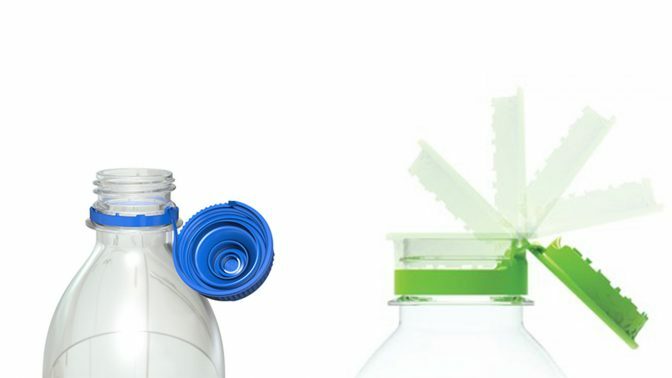 This innovative technology aligns with the Association of Plastic Recyclers “Caps-On” initiative to raise awareness of the importance of recycling the closure with the bottle. Stay-With™ is transferable to almost any application, including sports caps and flat caps. Great step taken by Aptar towards sustainable packaging.